Background: Diagnostic biomarkers of epilepsy are objectively measurable variables associated with the development of epilepsy or the propensity to generate seizures. Identification of biomarkers could be helpful for differential diagnosis and for tailored therapeutic approaches. 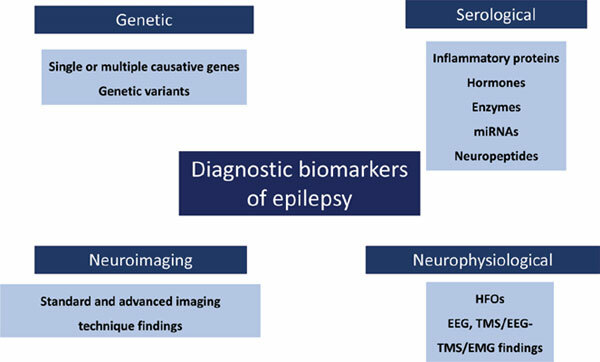 Objective: This review focuses on diagnostic biomarkers of epilepsy, including genetic, serological, neuroimaging and electrophysiological variables. Methods: References were mainly identified through PubMed search until December 2017 and backtracking of references in pertinent studies. Results: Several promising diagnostic biomarkers of epilepsy exist, with causative value or predicting liability to develop seizures after acquired brain injuries. Short non-coding RNAs are deregulated in serum and cerebral tissue of epilepsy subjects: these molecules are promising diagnostic biomarkers, being easy to assess and reproducible. Advanced imaging techniques may allow identification of subtle epileptogenic lesions, often with prognostic value. Novel electrophysiological biomarkers of epilepsy include perturbed cortical connectivity and excitability induced by transcranial magnetic stimulation, as well as high-frequency oscillations detected by intracranial and scalp electroencephalographic recordings. Finally, serological biomarkers may support the differential diagnosis between epileptic seizures and non-epileptic events. Conclusion: Ongoing research on diagnostic biomarkers of epilepsy is promising and future preclinical and clinical studies are warranted. Genetic, miRNA, HFO, TMS-EEG, prolactin, MRI, seizures.